Foreign Affairs Minister Chrystia Freeland has reminded Mexico and the United States her country must also agree on whatever those two countries agree to. 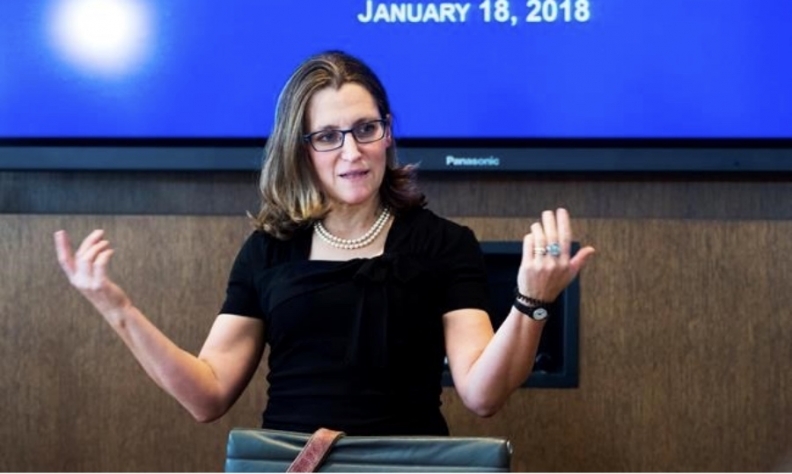 Canada's foreign minister said on Thursday that Canada would need to agree to any final conclusion on 'rules of origin' reached in bilateral talks between the United States and Mexico as part of the modernization of the North American Free Trade Agreement. Canada has been waiting on the sidelines for weeks, as talks have focused on settling differences between Mexico and the United States at the centre of U.S. President Donald Trump's complaint that NAFTA has undercut U.S. manufacturing to Mexico's benefit. "Updating the 'rules of origin' has always been a very big, important and complicated effort," Canadian Foreign Minister Chrystia Freeland told reporters. "Canada clearly has an interest in how those rules are updated and we clearly will need to look and agree to any final conclusion." Mexico's economy minister, also on Thursday, said he was pushing for a quick deal with U.S. officials in the renegotiation of the pact, with a breakthrough on new rules for the auto industry still elusive. Trump has threatened to withdraw from the 24-year-old trade pact between the United States, Mexico and Canada if it is not reworked to the advantage of the United States. He hopes to reduce the U.S. trade deficit with lower-cost Mexico and claw back jobs, particularly in the auto industry. "The idea is to do our best to finish this agreement as soon as possible," Mexican Economy Minister Ildefonso Guajardo told reporters as he entered the latest NAFTA talks at the offices of U.S. Trade Representative Robert Lighthizer in Washington. "It's better to have a good agreement than a fast [agreement],” the minister added. Mexico and the United States have said they are close to resolving remaining bilateral issues in the revamp of the trade pact. However, a day earlier Guajardo had said the two sides might be able to reach agreement in "hours." Canada has been waiting for the Mexican and U.S. teams to reach common ground on autos before rejoining the negotiations. The Trump administration wants to be able to impose national security tariffs on future Mexican production from new auto assembly and parts plants, according to auto industry officials. That has caused friction at the talks. Asked whether tariff-related issues in the automotive sector were holding up progress at the talks, Guajardo said he was "not going to comment on every single item." Guajardo has said he hoped that a deal in principle would be possible in August. Asked whether that was still the plan, Guajardo said that it was a "very efficient timeline."